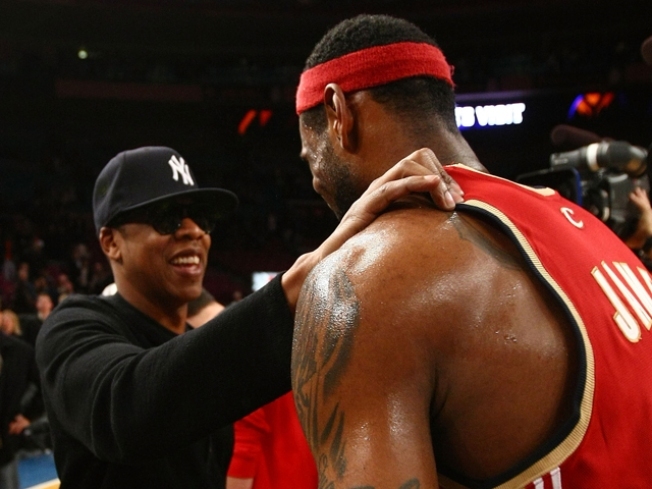 The NBA is investigating Jay-Z after the minority owner of the New Jersey Nets visited the Kentucky Wildcats' locker room. Noted basketball fan Jay-Z caught the University of Kentucky's win Sunday over the North Carolina Tarheels in the Regional Finals of the NCAA tournament and used his considerable celebrity to gain access to the victorious Wildcats' dressing room so that he could congratulate the team. Unfortunately, he's more than just a celebrity fan - he's also minority owner of the New Jersey Nets and now the NBA is looking into the true intentions behind the rapper's visit. Two Wildcat stars - Brandon Knight and Terrence Jones - are potential NBA Draft lottery picks, should they declare for the draft, which may make Jay-Z's visit an uneasy mix of business and pleasure. The visit was documented via photos - most taken by the surprised players. "It was crazy. I kind of had to do a double take," Kentucky player Darius Miller told Louisville's Courier-Journal. "I didn't expect that at all. I just had to get a picture with him." If Jay-Z is found to be tampering in any way, most believe he'll receive a fine comparable to that one the NBA levied against Boston Celtics General Manager Danny Ainge - Ainge was fined $30,000 for sitting next to Kevin Durant's mother while he played for the University of Texas in 2007.